This year we are continuing to provide 160 bursaries to ensure that runners and walkers have the opportunity to participate in community events like the Blue Nose Marathon. 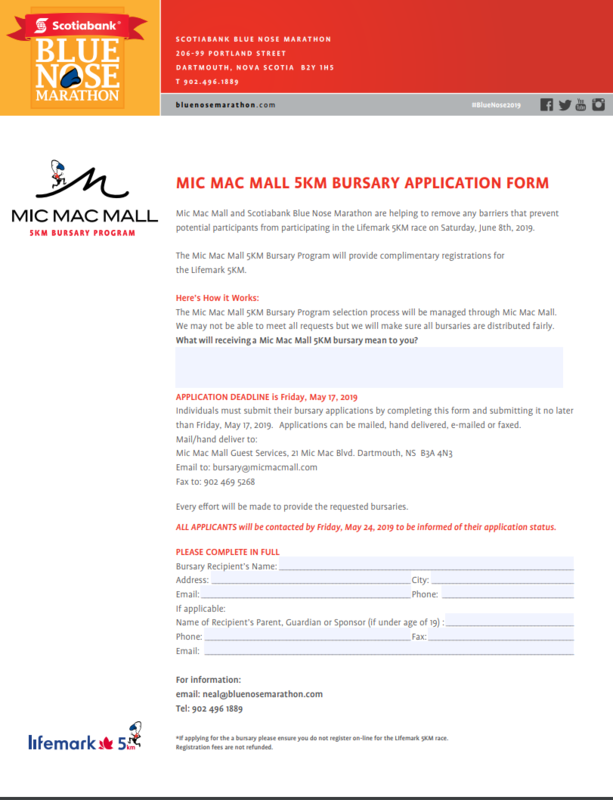 The Mic Mac Mall 5KM Bursary Program selection process will be managed through Mic Mac Mall. We may not have been able to meet all requests but we did make sure all 160 bursaries were distributed fairly. What would receiving a Mic Mac Mall 5KM bursary mean to you? This is the question that we ask all applicants. Is it to kick start a healthier lifestyle, reach a goal or even celebrate a milestone? Your answer will help with the selection process. See below for registration details! To apply fill out the bursary application (link below) and email it to [email protected].